Understanding some basic vinyl decking facts will help you determine if vinyl decking is the right choice for your project. Explore the pages in this menu for everything you need to know about installation, maintenance, applications, and product comparisons. Vinyl decking is constructed with Polyvinyl Chloride (PVC) which is man’s best attempt at prolonging the life cycle of various building products. It performs an admirable job in delaying the inevitable; however, all products designed for exterior use and under constant exposure of the elements will eventually show some signs of degradation. Manufacturers add UV screens and stabilizers to prolong the life of PVC materials. These additions are designed to assist the vinyl to resist cracking, embrittlement and discoloration. Some vinyl products are produced without any UV and Mildew Inhibitors in the bottom ply of the membrane. Duradek is manufactured for the highest quality with these important ingredients in both the top and bottom ply. 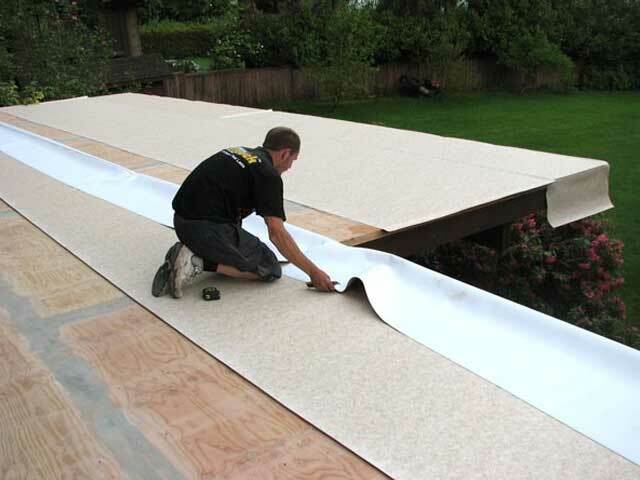 North American building codes dictate that 60 mil is the required thickness for pedestrian traffic roofing membranes (commercial flat roofs only require only 48 mil thickness). Today there are many decks still benefiting from the waterproof protection of 24 mil vinyl. When in doubt of how thick a deck or flat roof vinyl needs to be, always refer to the current building code standards. After a significant length of time, the initial appearance of a vinyl deck surface will eventually deteriorate, but this does not affect its ability to provide waterproofing. Duradek vinyl is one of the top performers for maintaining appearance from extended UV exposure when tested against other vinyl brands (test method for ASTM G-90). The lighter the color you choose, the cooler the surface will stay and the less deterioration will occur. Darker colors will fade faster and be warmer on the feet. All vinyl tends to ‘yellow’ slightly over time. Grays show it the most, while ‘yellowing’ is well hidden within earth-toned options. Duradek vinyl comes in 72-inch sheets that a professional installer rolls out, glues to the deck and heat welds together. Familiarize yourself installation considerations such as substrate preparation, slope requirements, and product compatibility prior to starting your decking project. How to get the most satisfaction and longest life from your low maintenance vinyl deck. Compare vinyl decking with other deck building and surfacing options. Consider how the benefits of Duradek vinyl decking makes it the best choice for architects, builders, and homeowners. Learn about what makes Duradek a “Green” building product that makes it an environmentally responsible choice.